I confess that when I bought this book my expectations were not very high. I’ve read dozens of P&P variations and the last ones were always a disappointment, but I was obviously unaware of the authors talent, or my expectations would have been very high indeed. 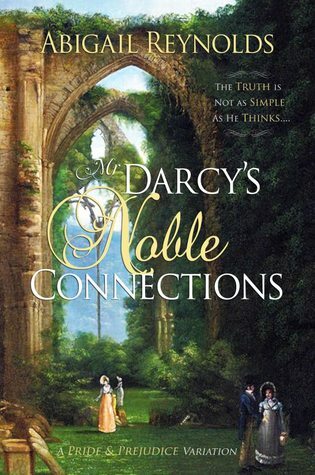 When I started reading Mr. Darcy’s Noble Connections I could not believe it! I was finally reading something that was not only good, but marvelous! I was afraid the story would disappoint me as I continued reading, but it never did! In fact, everything about the book was close to perfection! This variation takes us to a completely different scenario then P&P. Darcy and Elizabeth meet after the Hunsford proposal at Bentham Park, a house belonging to a mutual acquaintance, and it was refreshing to see a very different scenario with so many new interesting characters. These were excelente additions and the interactions between all characters were definitely a plus of the book. Darcy and Elizabeth remain faithful to their own personalities and the interactions between them are absolutely wonderful. The love story in this book is amazing, it shows a connection and understanding between them that is very touching and romantic. Above everything the love story is touching and interesting without ever loosing propriety, which is always a plus for me. There is another love story in the book that keep me interested and that was also another positive point in the book. I definitely recommend this to any P&P fan! Abigail Reynolds is one of the best JAFF authors, I’ve read and this book is a must read! Ever since I read Jane Austen’s Pride and Prejudice I fell in love with the writing, the story and the characters. I always wished I could read more about them, so when I discovered Mr Darcy Takes a Wife in 2012, and consequently the wonderful world of Jane Austen Fan Fiction, I became completely addicted to this genre. I started reading so many JAFF books that I found myself buying books in duplicate. At that point, it became obvious I needed to write down the ones I had already read, and what I thought about them. This would help me choose my future purchases, as some authors were clearly worth reading. Therefore, this blog is my attempt to create a website that could provide myself and JAFF readers a list of books that have been released on these topics, and a simple way of knowing which are worth reading and which are not. I always spend a lot of time in amazon trying to pick my next book because even in fan fiction there are several genres of books, such as prequels, sequels, retelling, what ifs etc. Also, Amazon does not distinguish those I liked and those I didn’t when it presents me with suggestions. So it’s very hard to know if I should buy a book or not. Taking that into consideration, I’ve organised my list per genre and author, this way I believe it will be easier for JAFF readers to choose their books. Also, I’ve added a short introduction of the books and my opinion after reading them, so that might help readers as well. I do hope this blog will help JAFF readers to know which books and authors are out there, and which ones cannot be missed. My favourite genres are what ifs, I enjoy some retellings, especially when they are from Mr. Darcy’s point of view, but I’m not a big fan of prequels or sequels, so that will influence the books I mention on this blog. I will always have more what if’s because they are my favourite genre. If you prefer prequels or sequels, you might not find many books of your interest in my list. Also, if you are new in the JAFF world, you have to know that there are books that follow propriety and books that don’t. I personally do not like books that do not respect propriety, so I might give a bad review to those books. They might not be bad if you like that type of book, but I do not enjoy them, and therefore they might get a bad rating/review because of it. I have not written my opinion of all the books I’ve read, and I’ve read so many that I have forgotten what I thought about some of them, so I will list them below, but I will not have a review for them. I will try to re-read most of them in order to write a review. Also, this blog is still a work under progress, so I will keep adding information and reviews of the books every day. Don’t feel disappointed if I don’t have everything on your first visit, I’ll try to improve and update it everyday. Now, I’m sure you’re also wondering why I’ve called it From Pemberley to Milton. Well, Even though I’ve started with Jane Austen Fan Fiction, I’ve also found fan fiction related to Elizabeth Gaskell’s North and South. North and South is one of my favourite books, and Margaret and John’s love is one of the most beautiful, strong and emotional I’ve ever seen. I have even considered several times if Mr. Thornton was better than Mr. Darcy! I know, it seems impossible right? But if you’ve read North and South, I’m sure you will agree with me that Mr. Thornton and his love for Margaret is not beneath Mr. Darcy and his love for Elizabeth. If you are a JAFF and North & South fan as myself, I hope this blog will help you select good books to read. If you are just entering the beautiful world of fan fiction, welcome!